Poems for Patience 2019, an exhibition of poems selected and introduced by poet Ailbhe Darcy, was officially launched on 12 April at University Hospital Galway as part of Cúirt International Festival of Literature. 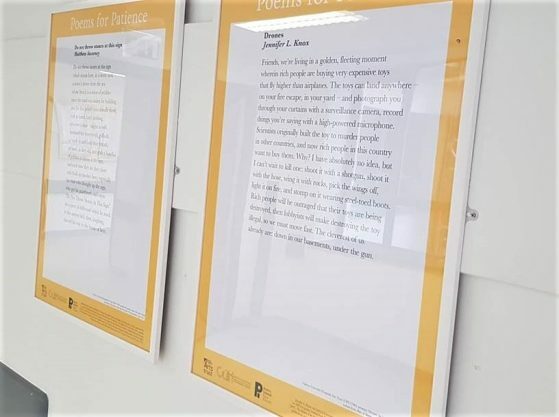 Poems for Patience is a long-running programme established by Galway University Hospitals Arts Trust in which poems are displayed on the Arts Corridor and waiting areas of the hospital and in associated hospital units. Poems for Patience is a collection of varied thoughtful poems by celebrated Irish and International poets. GUH Arts Trust is hopeful that the poetry will give people pause for reflection and space for hope in both those joyful celebratory moments as well as the all too often times of pain or worry. This year, Ailbhe Darcy selected 21 poems, including works by Tara Bergin, Ailbhe Ní Ghearbhuigh and Trevor Joyce. In conjunction with the Poems for Patience project, GUH Arts Trust has held an annual poetry competition since 2013. This year, the winning poem by Sinéad Mongan is ‘Daymare’. Sinéad read ‘Daymare’ at the launch and the poem will be included in the Arts Trust’s Poems for Patience poetry collection. Ailbhe Darcy’s most recent collection of poetry, Insistence (Bloodaxe, 2018), was shortlisted for the T.S. Eliot Prize and her first collection Imaginary Menagerie (Bloodaxe, 2011) was shortlisted for the dlr-Strong Award. The exhibition runs until 10 May 2019. For further information on Poems for Patience email guhartstrust@hse.ie or phone 091 544979.